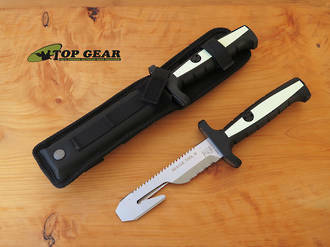 Hi all been looking at all the usual hunting shops for a specific knife for work, but as yet cant find anything. Preference would be a folding blade. Part of the blade needs to be serrated,(aporoximately 100mm minimum)due to the various materials it will need to cut thru. Any ideas or contacts of knife suppliers would be appreciated. What kind of rescue work? Thanks had a look at the vitorinox one, had a whole bunch of blades on it. Not really fit for our purpose all we need is a serrated blade as a must and as an extra a straight blade. Really just need a serrated blade and as an extra / bonus a straight blade. Leatherman wouldn't be suitable for our type of work. There are lots of rescue type knives around, depends on what you need want and expect it to do, Spyderco have a rescue type serrated blade with a blunt tip, gerber makes a partially serrated bladed with a glass breaker and seat belt cutter, letterman Skeletool has a rescue based version. Thanks shelly I will look into the ones you mentioned. Thanks. Benchmade triage are one of the best quality rescue knives you will find. find a straight bladed one that suits you and take to the bit of blade you want serated with a chainsaw file...it makes serations piece of cake and yes it will whip through seatbelt type material.